The North Carolina Digital Heritage Center is continuing its popular newspaper digitization program in 2013 with the addition of fifteen new titles from towns and communities around the state. To come up with the list of titles to be digitized, we asked public libraries in North Carolina to nominate historic papers of importance to their communities. We received a broad list of suggestions, ranging from 19th-century small town papers to mill town papers published in the 1960s. In making our selections, we sought to include papers from communities that were not yet represented on DigitalNC, papers that covered North Carolina’s diverse population, and papers from historically significant time periods. These papers will be published online throughout 2013. Keep an eye on this blog for announcements and features when each new title is available online. A 20-year run of the Tarboro Free Press is now available in the North Carolina Newspapers collection. Nearly 1,000 issues spanning the years 1824 to 1844 can now be searched and browsed online. The paper was originally published in Halifax, N.C., before moving after several years to Tarboro, at the time one of the commercial centers of eastern North Carolina. It is a typical paper of the era in that contains primarily excepts from other publications, speeches, legal announcements, and advertisements. The quality of the images of this paper is very good, especially considering its age. This has resulted in a more accurate machine transcription of the text, which should be especially useful for researchers looking for specific names and phrases. The original yearbooks are in the local and state history collection at the Cumberland County Public Library in Fayetteville. A handful of student yearbooks from Burgaw High School are now available in the North Carolina High School Yearbooks collection. The yearbooks, from the years 1956 through 1962, are from the local history collection at the Pender County Public Library. I’m embarrassed to admit that it took us a while to figure out the origin of the title of the yearbooks: “The Wagrub.” We thought first that it might be a Native American name, or maybe something from a school song or cheer, before finally realized that it is, simply, the name of the town spelled backwards. 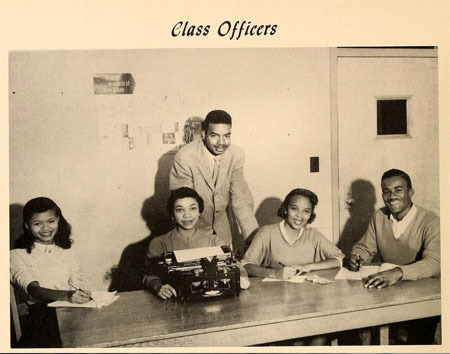 These yearbooks complement other materials from the Pender County Public Library already available on DigitalNC, including a great set of scrapbooks compiled by the Burgaw Jaycees in the 1950s. Along with 65 editions of The Chowanoka (Chowan’s yearbook) and 118 course catalogs already available on DigitalNC, these student newspapers contribute to a rich picture of life at a small college in North Carolina from the perspective of both students and administration. Chowan’s current Department of Graphic Communications has a long history at the university, and the strength of this curriculum is reflected in the quality of both design and content of different newspaper titles over the years. From the late 1950s through the early 1970s The Chowanian used a magazine-style layout with covers that capture its period’s graphic design zeitgeist. A later title, Smoke Signals, used a more traditional newspaper layout that also produced visually interesting front pages. If any Chowan alums are reading this post, leave a comment! We’d love to hear from you about your involvement with Chowan’s long tradition of student-produced newspapers. New Slideshow — Caro-Graphics: Do You Know Your State? Caro-Graphics, a single panel cartoon focused on North Carolina history, trivia, and oddities, ran in The Pilot (Southern Pines, N.C.) from 1935-1937. We have assembled a slideshow of a sample of Caro-Graphics from this run, highlighting the variety of reader submissions illustrated for the comic. 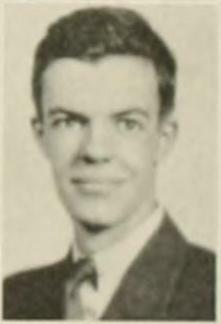 Primary creator, Murray Jones, Jr. of Durham, worked on Caro-Graphics during his time as a student at Duke University – we have included a photo of him from the 1934 edition of Duke’s yearbook, The Chanticleer. 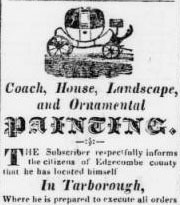 He went on to become a prominent artist and professor of the arts. He died in 1964; today would have been his 97th birthday. Caro-Graphics have been featured previously on NC Miscellany, through which the strip garnered the attention of comic strip historian Allan Holtz. Soon afterward, Caro-Graphics were featured as the “Obscurity of the Day” in Holtz’s blog on American newspaper comic strips. Earlier this year, Murray’s career and personal life were described in an “Ink-Slinger Profile” on the blog. Thanks to Holtz and his colleague Alex Jay for their help in providing more contextual information about Jones and Caro-Graphics. These home-grown comics provide another lens through which to look at North Carolina history, culture – and humor!